Is Justin Bieber Becoming A Style Icon? At the very least, the pop star deserves the award for most improved personal style. 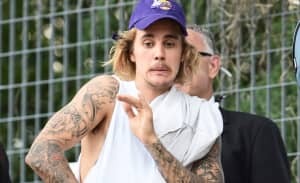 2014 was a famously bad year for Justin Bieber, with DUI charges, vandalism arrests, and an all-round unlikable attitude that eventually led to the creation of a White House petition asking that he be deported from the U.S. Fittingly, his crimes against fashion were just as problematic, peaking in May of last year with the wearing of a pair of floral shorts so weird and oversized, they can only be described as pantaloon culottes. Thankfully, 2015 is the year that Bieber is makes amends with the world. Not only does he have a certified platinum hit song with Skrillex and Diplo's Jack U project, he’s starting to look, dare we say it, kind of cool. Bieber hasn't quite reached Kanye-levels of style icon-ness yet, but he’s clearly gone to a tailor and, with his oversized T-shirts and well-cut suits, seems to be taking cues from well-dressed kids like Jaden Smith and Nick Jonas. He also partnered with Calvin Klein earlier in the year, and he’s developed an interest in the fashion world. In a cover story with Interview magazine out this week, he even discusses having a meeting with the grand dame of fashion, Anna Wintour herself. Surely, Wintour will remind him that there is no better way to show the world he’s a new man than by looking like one—a stylish one. Here we track his style evolution, one Instagram at a time. This is what Bieber left the house looking like just last year. He had a style preference for what can only be described as JNCO/board short hybrids. Things started getting better earlier this year, when it was announced that he’d be a spokesperson for Calvin Klein. He showed up to his Comedy Central roast looking pretty sharp in a bright blue suit—and it fit. He even modeled for Vogue with his longtime homie Kendall Jenner. Maybe his stylish friends Kendall and Gigi were starting to rub off on him? And just last week, this how he hit the streets. A vast improvement. ...is much better than this…. ...and whatever is happening here, minus the cute kid.